The Miami Dolphins' head coach and general manager getting along? Weird. The well-documented disconnect between former Dolphins GM Jeff Ireland and current coach Joe Philbin came to a head in 2013, as Philbin made Ireland's rookie class by far the least active in all the NFL. That was only one piece of evidence, though it was a pretty telling one. Ireland, who reportedly also had issues with the Dolphins' last head coach, Tony Sparano, parted ways with the team earlier this offseason. Miami had a hard time getting anyone to take Ireland's place but was able to settle on former Tampa Bay Buccaneers executive Dennis Hickey. 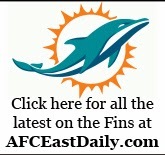 And according to Armando Salguero of The Miami Herald, Hickey and Philbin have bought into each other. "The two men now atop the football side of the Dolphins organization have spent their mornings the past week or so watching tape together," Salguero wrote Wednesday. "They've spent it dissecting both college and pro prospects. They've been obviously prepping for the coming NFL combine. And they've been grinding on potential unrestricted free agents." It seems ridiculous that a general manager and coach being on the same page is actually news, but it's truly the first step for an organization that has shown some dysfunction over the past half year. Also, there is a perception that Hickey is simply just the 'yes man' owner Stephen Ross was looking for, as Ross seems to be big on Philbin and his team philosophy, and other GM prospects reportedly turned down the opportunity because they wanted more control than Ross was willing to give.